A win is a win, but it was a frustrating day all round for some at Edgeley Park, as Charlton really should have cake-walked this game, but were made to hang on ingloriously at the end. Goals from Sam Sodje (left) and Scott Wagstaff gave the Addicks a comfortable lead, before a fluky injury time cross went in (somehow) and the Addicks had to hang on while time was played out. The spectacle wasn’t the best, especially as I’d forgotten my glasses for the second week running, but the trip up north went OK, bar dropping a glove at Leeds (thank you to the lovely lady who ran after me to give it back! ), and 20p as I bought a programme. I should also mention the great Full English that I had for lunch in Mackenzie’s in Stockport (opposite the Town Hall) which set me up for the rest of the day. 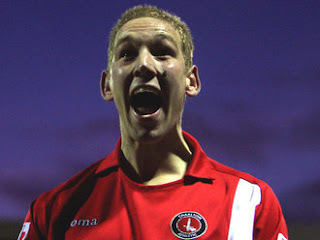 Charlton started the game as their position near the top of the league would suggest when playing the bottom ranked team; within minutes, Dave Mooney was put through but shot too close to the ‘keeper, and then almost immediately afterwards he failed to beat the ‘keeper again first time when a poor clearance came to him. The home team hadn’t had a kick up till then, and soon they were indeed one goal behind. Grant Basey’s corner was headed in by Sam Sodje who had made a darting run to the near post. Basey was lucky to still be on the pitch, and even walking, as a very poor and late challenge from Poole caught him heavily in the groin area, and Basey was in acute pain for quite some time. Poole was rightly booked for having his boot so high, and it looked like it took Basey over twenty minutes to fully recover (though evidence of that may have had to wait till later). Sadly, Mooney then fluffed a couple more chances, and as Charlton sat back, the home team saw more possession and started to pass the ball about well. This despite the dodgy pitch, which did not look as bad as predicted, but was very strange when compared to others played on recently. It wasn’t at all waterlogged, or very muddy, but the pitch was very soft, and the ball did hold up on it and not run true. This proved a problem for dribblers like Lloyd Sam (though not Scott Wagstaff..) and to a certain degree Jose Semedo, but actually helped Mooney whose runs behind the defence regularly saw him reach the ball before the ‘keeper had a chance to come and claim. The home side grew in confidence as Charlton failed to extend the lead, and first Bignall missed an open goal after a break down the right exposed the Charlton centre backs, then a scramble saw a shot hit the bar and the resulting efforts blocked by Semedo and Elliot when it may have been easier to score. It could easily have been 5-2 at half time, with Mooney missing four gilt-edged chances, but the Addicks would have settled for a one-goal lead on that pitch prior to kick off I’m sure. With Charlton kicking towards their own fans in the second half, you hoped that the team would not sit back and would put some pressure on, but the match fell into that familiar pattern. Charlton looked to hit Stockport on the break, and relied on the excellent defensive work of Christian Dailly, Sam Sodje, and Semedo to keep their lead. Annoyingly, the ball was given away far too often, usually unnecessarily too, as passes from midfield went straight to the blue shirted team and not to where they should have. Nicky Bailey, Semedo, and Basey were all culpable, and Mooney’s frustrating afternoon continued when he saw a shot saved once more after bursting through. Deon Burton had got stuck in the mud, and he was substituted for Akpo Sodje with half an hour to go. Charlton then had their best chance of the half, as a fast break saw Mooney play in Sam, but he also failed to get the ball past the ‘keeper in a one-on-one; the rebound fell invitingly to Wagstaff, but his first time effort flew very high and wide of a gaping goal, possibly due to the pitch? Minutes later though, the lead was extended, as a first time reverse pass from Mooney found Wagstaff inside the area, and he simply passed the ball into the far corner of the net, and celebrated in the arms of travelling supporters (left). Akpo Sodje then burst through but failed to get his shot away, and the home crowd went quiet as the game trundled toward an anti-climatic end. Four minutes injury time was signalled, and around three of those had passed when a speculative cross from the left floated over Elliot in goal and hit the post; the ball then bounced back onto the Charlton custodian and over the line before Elliot could scoop it away. Such was County’s luck this year that many thought they would be denied the goal, but eventually play stopped as the referee signalled it had gone over the line. The referee had been good throughout, but quite lenient when compared to some we have had this year. He was soon in action again as Sam was booked for a foul after he had once more given away possession. This signalled an immediate change from the bench as Phil Parkinson looked to waste some time (just as the free kick was being taken), but Sam was tardy in answering the call as his number went up and received an ignominious push to help him on his way. This sparked a general melee and during this 18-player confrontation, County’s best player - Baker – was sent off after using what looked like an elbow on Bailey. Bailey was rolling around once more at the end of a game and once more you had to question how badly he was hurt. Semedo meanwhile was just trying to keep everyone from treading on the prone Charlton captain. You hoped that the ref would blow for time when the free kick was finally delivered into the box (Elliot catching confidently) but he actually allowed play to go on and another Stockport attack had to be repelled before the final whistle went. In the context of the season, this was a good victory, especially as Leeds and Norwich failed to win, but from a fans perspective it was frustrating that Charlton hadn’t gone into such a lead early on that conceding last minute goal is superfluous. The players and management came over to offer thanks to the 500 plus travelling fans and then it was back onto the trains for my journey home. A slight error in Manchester saw my route home altered - through Sheffield to Doncaster rather than via Leeds - but it was fun watching the xmas revellers and shoppers going about their way. Four wins on the trot is good stuff in the lead up to the seasonal games, and one more good result next Saturday will give everyone connected with Charlton a very happy Xmas!